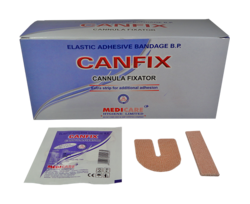 Our range of products include cannula fixator i and u (canfix). We are one of the noted manufacturers, suppliers, wholesalers and exporters of IV Cannula Fixator with the brand name of Canfix . Our offered array of products is manufactured from the superior quality range of material in strict adherence with the industry standards and norms. Simple to use, painless removal. No irritation and no traces on the skin. Allows air and humidity to pass freely. Non-allergic adhesive with paper liner for easy removal. Fixes the cannula in the region of insertion till the procedure is completed.